Quality small-cap companies have the agility to shift and change focus to accommodate new opportunities as they arise. Today’s ASX-listed junior explorer, Alloy Resources (ASX:AYR), has done just that. With multiple projects on the go, it has now struck a deal to gain total control over a highly prospective project that it formerly explored as a junior joint venture partner. 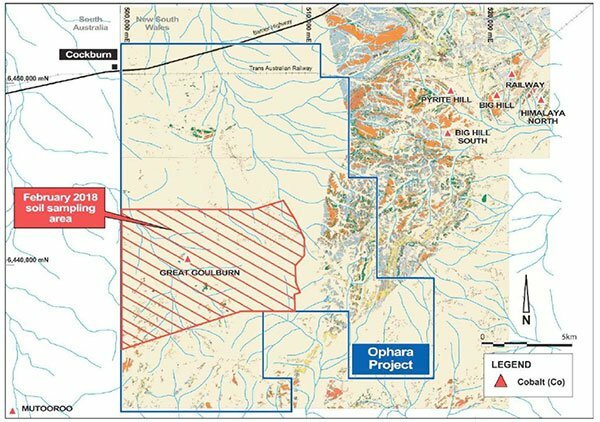 This company owns some highly prospective acres at the Horse Well gold project in WA, and has now acquired an option for adjacent high-potential tenements. The last time we checked in with AYR it had just nabbed a unique cobalt opportunity in Broken Hill, acquiring the Great Goulburn Cobalt-Gold prospect. 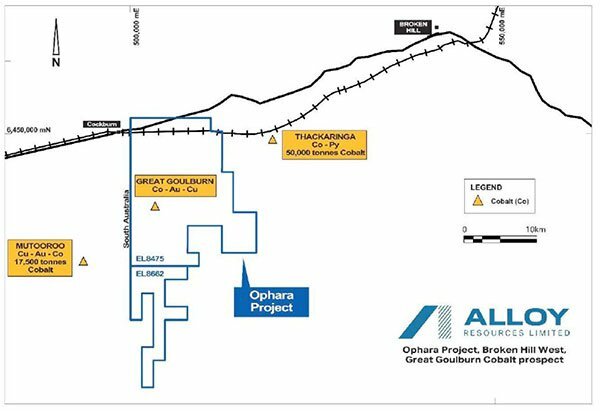 AYR is now busy exploring this prospect at its Ophara Cobalt-Gold Project in hope of finding a large cobalt Resource (with pyrite) — maybe something like the 50,000 tonnes its neighbour Cobalt Blue (ASX:COB) has discovered at its nearby Thackaringa Cobalt Project. AYR’s interest in the Ophara Project was based on six historical drill holes, four of which showed intersected mineralisation and results of 8 to 20 metres at 0.15% cobalt and 0.3-0.4 g/t gold at depths of less than 80 metres, the shallow nature of which bodes well for this junior explorer. The company has just completed a large surface sampling program over a 60 square kilometres area at Ophara, which cover potential extensions and repetitions to the Great Goulburn cobalt-gold mineralisation. Results are expected within three weeks. It’s a good time to be a cobalt explorer as cobalt is one of the foundations of the clean energy future. If demand plays out as projected, we could see lucrative times ahead for well-managed cobalt juniors, the likes of AYR. 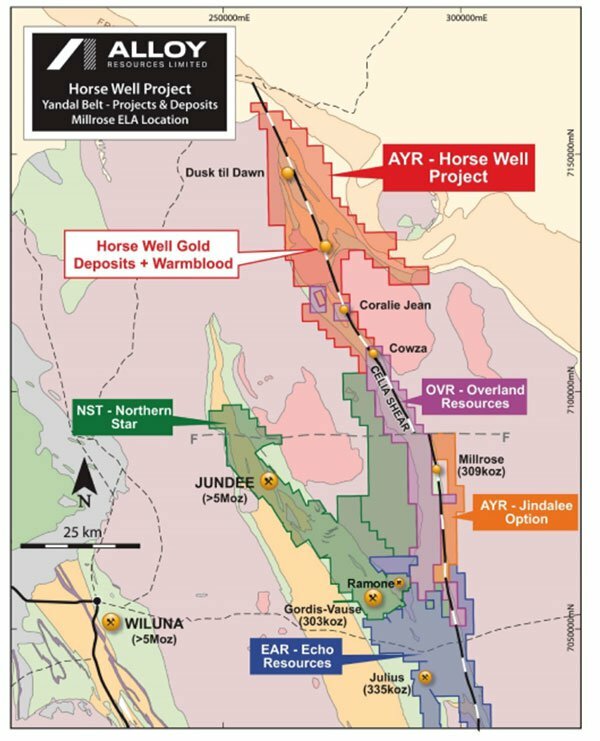 But arguably the most interesting of AYR’s news is its moves to get ‘back on the Horse’... we are of course talking about the geographically-significant Horse Well Gold Project in WA. 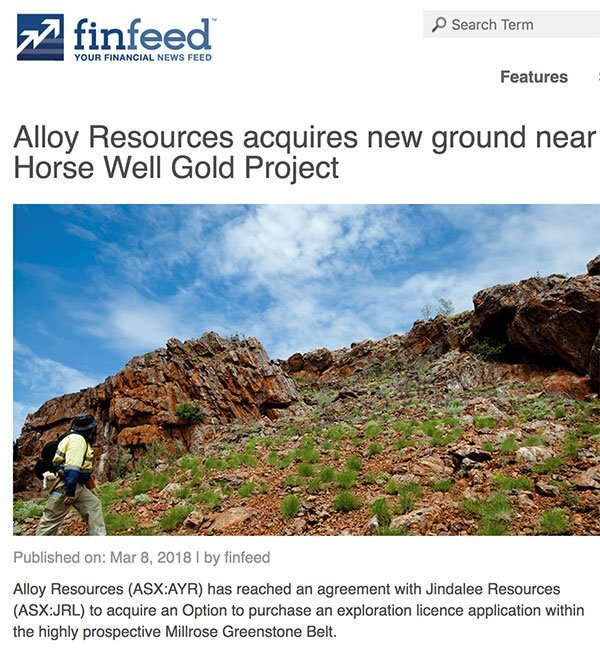 AYR’s holding at Horse Well is just 50 kilometres from $3.9 billion capped Northern Star Resources’ (ASX:NST) Jundee Gold Mine, the market cap of which has risen from $2.5 billion when we last wrote about the company — a potential indicator of the interest and prospectivity of the region. With high-potential tenements in gold-rich WA and landholdings in the new cobalt hub of Broken Hill, AYR is setting up a solid foundation at the doorsteps of major, world-class developments. Of course it is an early stage company and investors should seek professional financial advice if considering this stock for their portfolio. AYR is on the hunt for a game-changing deposit. Even better if a discovery happens right next door to a major player who may have interest in taking ownership... and would be willing to pay the price. That’s one way to get major shareholder value for A$7.7 million-capped AYR. AYR now has a majority stake and gained control of the project and has plans to lift its interest to 60% in due course. Before AYR held majority ownership of Horse Well it was unable to maximize the project to its potential including focusing on the discovery of large new gold deposits as well as smaller high-grade deposits. Jundee’s total endowment is a massive 10 million ounces. 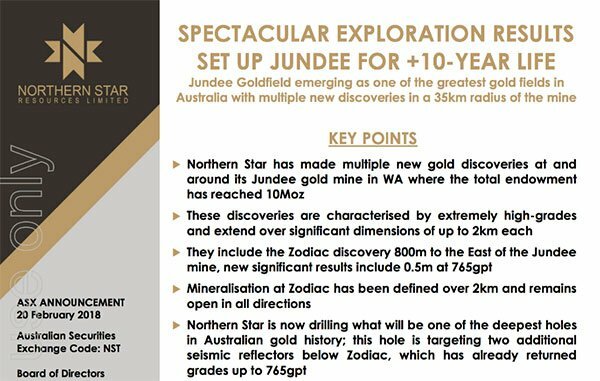 Its Zodiac discovery was announced only recently ... with high-grade results including: 0.4 metres at 765g/t gold, 2.4 metres at 21.2g/t and 2.9 metres at 10.4g/t. 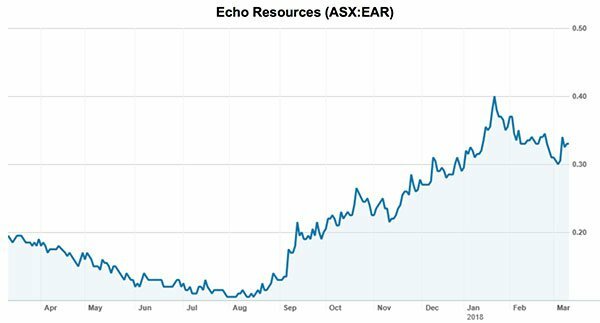 Approximately 25 kilometres further south, Echo Resources (ASX:EAR) is exploring its considerable gold-prospective tenements, which host an Indicated Resource of approximately 1.7 million ounces of gold (27.4 million tons at 2.0g/t). Importantly, this is right where AYR has a promising asset of its own. Last but not least, fellow junior Overland Resources (ASX:OVR) is exploring a region sandwiched between AYR’s tenements. OVR has discovered a new greenfields discovery on a license which AYR surrounds. OVR is soon to start drilling for gold at the project, with funding now available thanks to a recent $2 million capital raise. All of this activity paints a pretty picture for AYR. It’s been a somewhat long journey for the company to get to this point at the gold-prospective Horse Well Project. But it has succeeded in re-gaining managing control of the project, by increasing its stake to 51% through $300,000 cash and $200,000 in AYR shares. Interestingly, if you refer to the latest agreement with JV partner Doray Minerals (ASX:DRM), it states that a Resource discovery exceeding 1.5Moz enables Doray clawback rights... which would entail it paying AYR three times the exploration costs as well as free carry 49% of costs towards a BFS. If the discovery is less than 1.5Moz, AYR retains management and develops the project as it sees fit. Either outcome would be a win for shareholders of this small-cap. The tenements are in prime condition, having had $7.9 million spent on them by the JV over the last five years. Naturally, AYR’s focus is now to define exploration targets which it plans to commence by the end of this month. 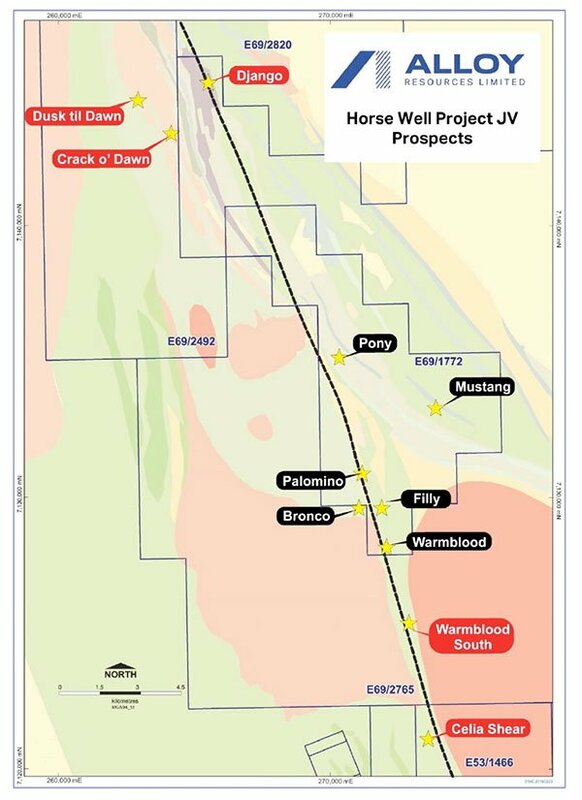 Horse Well has a shallow high-grade Inferred Mineral Resource of 75,000 ounces at 2.76g/t gold, and numerous prospects at various stages of exploration, making it a stand-out exploration property in WA’s Goldfields region. AYR has advanced drill targets ready to go at its Dusk til Dawn and Warmblood prospects, plus air core (AC) drill anomalies up to seven kilometres long which are ready and waiting for infill drilling. A primary target for AYR is the Celia Shear extensions coming out of OVR’s recent high-grade surface quartz vein discovery at the Coralie Jean deposit. AYR reached an agreement with Jindalee Resources (ASX:JRL) to acquire an option to purchase an exploration licence application within the highly prospective Millrose Greenstone Belt, as pictured above. The Jindalee exploration licences are adjacent to Horse Well Project which is adjacent to Northern Star’s world class Jundee Gold mine. Jindalee is also right next door to OVR’s and EAR’s respective gold-prospective tenements (both of which are attracting plenty of interest). The licences are on the Celia Shear — a major mineralised structure which extends into the eastern margin of the Millrose Greenstone Belt. The tenements surround Millrose’s eastern flank, which has an Inferred Mineral Resource of 309,000 ounces of gold. This could significantly enhance the potential for AYR to make major gold discoveries as it expands its coverage across the Celia Shear, from 60 to 80 strike kilometres. Further, Jindalee is just eight kilometres east of NST’s formidable Ramona gold discovery. Yet AYR remains a speculative play and investors should approach any investment in this stock with caution. The option was acquired for A$50,000 plus $50,000 in AYR shares and requires AYR to spend a minimum of $34,000 on exploration during the first year of the grant. Meanwhile, AYR is still chasing its cobalt dreams on the other side of the continent. In February, the company commenced exploration at the Ophara cobalt-gold project (and possible extensions over a 60km2 area) including a large soil sampling program aimed at defining drilling targets in an area between Cobalt Blue’s (ASX:COB) Thackaringa and Havilah Resources’ (ASX:HAV) Mutooroo major cobalt deposits. It is hoping to spy a major deposit, in the same way other companies in the area have hit the jackpot. This sampling programme will hopefully trigger the next round of drill targets, for possible extensions and repetitions of the Great Goulburn cobalt-gold mineralisation, which could see the small-cap heading straight for a major discovery. In fact, the soil sampling program is now complete with a field inspection of the soil profile suggesting meaningful results for cobalt-gold enrichment in soil as well as a number of associated pathfinder elements. AYR collected total of 792 soil samples on a variable grid spacing including 200m x 100m around the Great Goulburn prospect, 400m x 200m more generally and some areas at 200m x 200m. Soil samples have been submitted for low-level analysis of 51 elements. Whilst traversing the ground by foot and vehicle a number of interesting outcrops were mapped and rock chip sampled. In addition to this some outcropping geological units similar to the Thackaringa deposit host rocks located in the east of the project were inspected and rock chip sampled. A total of 54 rock chip samples have been submitted for multi-element analysis. Results are expected to be received and interpreted within three weeks. This activity follows a round of reverse circulation (RC) drilling in November, with an initial nine priority RC holes drilled to 150 metres depth, designed to test the strongest conductors from a recent VTEM survey. The company learnt a lot about the prospect through the RC drilling, including the considerable scope down the track to define new targets related to potential bedrock sulphide sources. Re-visiting the VTEM data over this prospect area with a view to highlighting areas of shallow weathering that have (more subtle) potential conductive bodies similar to the pyritic sulphide zones at the drilled Great Goulburn cobalt-gold prospect. Undertaking an independent review of surface and drill geochemical data related to the Great Goulburn area to define the characteristics of the mineralisation (underway). Plan and complete an appropriate surface survey that will effectively define cobalt-gold-copper geochemical anomalies (underway). Combining this geophysics and geochemistry to outline new drill targets for testing in the current quarter. With any luck, the next round of news AYR releases on Ophara will confirm what the company has its hands on and provide an opportunity to investigate a thoroughly under-done prospect that has been quietly waiting for the cobalt craze that is now upon us. Given its history at the Horse Well project, management’s handover should be relatively straightforward for AYR. Some exploration priorities are set to change, however, as AYR plans to put equal focus on the discovery of large new gold deposits as well as smaller high-grade deposits. Of interest right now is that the central and eastern anomalies at Horse Well are associated with newly defined intrusive granitoids along the prospective Celia Shear — an area which has become a focus for AYR as significant exploration results have emerged out of OVR’s Coralie Jean prospect (situated at the most southern end of Horse Well). This suggests that the Horse Well tenements are extremely prospective along the entire strike length... and that’s certainly music to AYR’s ears. Although there is still much work to be done and investors should seek professional financial advice if considering this stock for their poirtfolio. Meanwhile, AYR eagerly continues its hive of exploration activity at the Ophara cobalt-gold project in Broken Hill. Having announced in November a neat A$600,000 addition to the company purse (via an oversubscribed share placement plan), it reported a respectable A$1.3 million in cash at 31 December. No doubt those funds will be utilised in the most resourceful ways possible... and will hopefully result in the discovery and delineation of some major high-grade deposits. Whether it’s pursing its cobalt hopes in the east, or rubbing shoulders with world class neighbours in the busy Goldfields region in the west, there’s plenty keeping this $7.7 million-capped junior busy, and lots of reasons to expect more news right around the corner.